And with "just" I mean 11.4 million years ago, even while Steve Fossey just detected this bright and rare Type Ia supernova using a 'modest telescope in an unlikely spot: foggy north London.' Scientists say that it will be visible in the sky soon, as it brightens up. 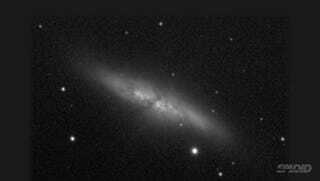 Here you can see the supernova appearing in the sky, in a before an after image of M82, the Cigar Galaxy. It is also a rare and up-close look at a type Ia supernova, which seem to explode with a predictable brightness, suggesting a common origin. The 1987 supernova was in a different category, type II — explosions thought to result from the collapsing cores of giant stars. A type Ia supernova is thought to form when stellar material piles onto a white dwarf — an old dim star that has already shed excess mass — and passes a critical threshold, igniting a thermonuclear explosion. According to the astronomers looking at M82, we will be able to see it in the sky as it brightens just by using a simple pair of binoculars. Obviously, it's not going to be as glorious as the supernova coming soon to the Milky Way, the one that, according to astronomers, will light up the night sky in the next 50 years. That one will be The One.